With this fun-filled intinerary, your morning will be filled with aquatic adventures, then during the afternoon you’ll delve into the Earth to discover the mysteries of the ancient world. The Estuarium is an aquarium with unique exhibits about the Pamlico-Tar River System. An estuary is formed where fresh water and salt water mix together, creating a dynamic and vital ecosystem. The Estuarium features over 200 exhibits with unique environmental artworks, living aquariums, and the “Crab Pot” gift shop. Special programs are offered throughout the year, as well as group programs. A children’s scavenger hunt activity at the museum is available on the website www.partnershipforthesounds.org. Native plants fill the Estuarium gardens. Program offerings include: North Carolina’s Black Bear, North Carolina Blue Crabs, Fish Printing, Bird Identification. Depart for Pamlico River Ferry in Bayview at 12:45 pm. Ferry departs at 1:30 pm. 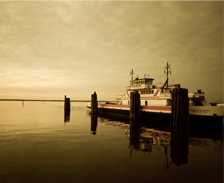 The Pamlico River Ferry offers a 30 minute ferry ride across a body of water known for good fishing, crabbing, and recreational boating. Aurora, North Carolina is home to the world’s largest phosphate mine, PCS Phosphate. Participants will venture into the mine, learn how phosphate is mined, see land reclamation in process, and learn how phosphate makes a difference in everyday life. The Aurora Fossil Museum provides an entertaining prehistoric adventure for the whole family. Located in the town of Aurora, the museum showcases marine fossils from the nearby PCS Aurora Phosphate mine, as well as native American artifacts from across prehistoric North Carolina. Of special interest are teeth from the giant megalodon and other sharks, marine mammal remains, and an excellent collection of prehistoric projectile points. Visitors have a chance to dig their own 15 million year old shark teeth from our fossil pile and view a video on coastal geology video-all for free!